From Dracula to Star Wars and beyond, Peter Cushing was an unforgettable presence in cult cinema of the fifties, sixties and seventies. He remains, 100 years after his birth, one of Britains best-loved film stars. Drawing upon conversations with Cushings friends and colleagues, and previously unpublished correspondence with Cushing himself, this is the definitive guide to his career. May is a very busy month for fans of horror movies and its stars – today is the 91st birthday of Christopher Lee and would have been the 102nd birthday of Vincent Price but, with yesterday being the centenary of Peter Cushing’s birth, all focus has been on the much-loved british actor and gentleman. Titan Books have released this exhaustive and beautifully executed volume which covers Cushing’s entire career from birth to his death in 1994, sadly between the two instalments of television’s ‘Flesh and Blood’ documentary as a history of Hammer Films with his old friend and colleague Christopher Lee. I’ll kick off with a cautious ‘buyer beware’ message, but it’s only to those who have already a copy of ‘The Peter Cushing Companion’ from 2000, of which this is an updated and revised version – and I only note that as I’ve seen a few comments ion review sites where purchasers have suddenly become aware that they have read some of this edition’s contents before. But if you don’t own the earlier version, and probably even if you do, you won’t fail to see the care and love with which this has been put together. Between the sturdy hardback covers lie fantastic photographs, many of them very rare, detailing the actor’s career and his life, with informative text and great anecdotes throughout. 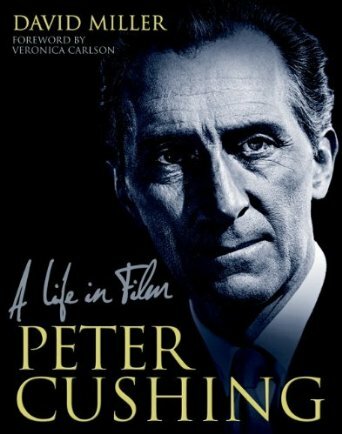 I thought I was a fan of Peter Cushing, then I read this and realised that I had barely scratched the surface of what the man achieved in his acting career, but also in his artistic pursuits, his writing and his generosity to others. The man was a legend and an inspiration and the more I read of him , the more I find that the qualities and attributes he possessed and expressed are things that are so sadly lacking in our current lives – the world was a better place when Peter Cushing was in it. At 192 pages, split into chapters detailing the chapters in his life, this is a lovely ‘coffee-table’ read ideal to dip into, and to use as a point of reference for the future. But, once I’d made a start on it, I was compelled to continue reading until it was done – devouring the entire book in just two sittings. The details in the chapters, coupled with the great indexes in its end papers provided me with so many elements of which I had no knowledge previously – that Cushing starred in an early Laurel and Hardy film and that three of his earliest plays were acted out in a (now no longer in existence) theatre that was a ten minute walk from where I live, were just two of many little gems I picked up along the way. The actors that Cushing worked with is an incredibly extensive list, as is the list of roles and classics that he became a part of – there can’t be many actors out there who can say they have been in Hamlet, Robin Hood, Star Wars, Frankenstein, Dracula, Sherlock Holmes, 1984, Dr Who and Space 1999 to mention just a few – reading this book had me pause to consider creating a ‘six degrees of Peter Cushing’ chart – but I feared I would go mad with the connections it would throw up. There appears to have been no darkness in Cushing’s life, only sadness (at the loss of his one love), with all of the darkness played out on the screen by a man who seemed to be so at odds with the evils taking place in many of his best known works. With the huge library of his work and television features we can enjoy thanks to DVD and to Youtube it’s easy to see the actor turning from a dramatic and deadly monster scene, waiting for the camera to stop rolling, and then breaking into a smile – you only have to watch one of his many appearances on the Morecambe & Wise show to see the fun side of the man. 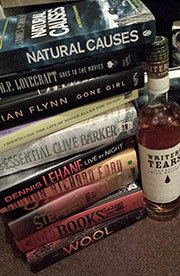 In fact, the only thing I found jarring about the whole of the book were the two mentions of his involvement with the ‘Jim’ll Fix It’ show – firstly as part of making wishes come true for two young horror fans who wanted to be made up as movie monsters and to try to scare him, and then later in life when he featured on the show having a rose named after his dear wife, Helen. With the revelations that have since come to light about the host of that now tarnished show, it seems somehow ironic that the greatest monster hunter of our silver screen shared the small screen with such a vile creature, and yet was without his crucifix or silver bullets – even the Tardis could have come in handy to change the course of events there. The perfect companion book to accompany new fans as they discover Cushing’s vast catalogue of work, and the perfect tribute to have on the bookshelf for those who wish to join in the celebration of the actor, the man, the hero and anti-hero, the gentleman. And you can order your copy from amazon HERE.